What a hot day we had today. Em played in her last soccer tournament for the season. The Salsa Tournament in Raytown, Mo. So fun but sooooo hot! We did get to splash around in our friend's pool in Blue Springs (home of AI David Cook!!) for an hour or so in between games. We are now at the Best Western in Platte City, just 5 minutes from KCI. We have our churches Stake Conference in the morning. Elder Holland will be here from Salt Lake. We are all sooo excited! Several church members are staying at the same hotel. Jacks and Em are swimming, Dave is reading up in our room and I'm sitting in the cozy lobby by the fireplace writing. Imagine that...me writing. I sooo love this. I can already feel my soul starting to breathe easier and just relax. Love that about my writing. Man, I'm loving this keyboard, too. I'll have to look into buying one. Besides posting about our weekend get-away, I'm ready to share something exciting with you. Starting June 30th I have decided to take the Body for Life fitness challenge. It is a 12 week long mind, body and soul transformation. And when I say take the challenge...I mean I am actually going to take photos, do the work and turn in my official BFL entry form. I have tried this before, made it nearly half way through and quit. I've been reading old journals of my last challenge and the changes I was making...all so good. Why I quit I'll never understand. This time though...this time I want it so bad. Why June 30th? Several reasons. #1 is that is when the next challenge starts. The last one for the years begins Sept. 6th but I don't want to wait that long. Sure, I've tried talking myself out of this time...I mean I've got a family reunion, trip to Chicago and local fairs coming up. All of them involve FOOD. But honestly there is never going to be a right time. NEVER. So, I'm just gonna have to enjoy the event rather than the food, right?! Since I've decided to begin the Challenge, I've found myself eating all my favorites. Mexican food, brownines, pizza and ice cream. With each bite I take I say to myself, "Enjoy this now because soon you won't be able to." That really isn't true. With BFL you are encouraged to take one FREE day and indulge a bit. So instead of eating poorly everyday you get to eat one or two of your favorite junk foods once a week. To help me get through this challenge and to keep it honest I'm going to log everything here. Even my dreaded "Before" photo. YIKES!! I know I have almost a month before the Challenge begins. I'm going to prepare by making a core list of meals and snacks, exercise plans and get my body used to getting up earlier. I am excited at what the future holds. This quote is on one of my favorite t-shirts I bought last summer at American Eagle. Whenever I wear it I just feel happy! A few months ago I was at a church Relief Society activity and one of my friends commented on my shirt. My good friend Kelly happened to be listening and said, "It is cute and so something that Les would wear!" Her comment made me feel so good. I strive to be one of those people that is happy every moment of everyday. Granted it doesn't always work that way...I can be down in the dumps or grumpy just like anybody...but I try to always see the glass half full. We have been working on the word "smile" all week. How is it going? This morning my daughter was having a bit of a meltdown. I'll admit I wasn't handling it too well. Grumpy, whiny children turn my smile upside down in a flash. (LOL!! ) Our word kept floating in my mind...smile, smile, smile I told myself. I did and while it didn't make Em's bad attitude go away it made my bad attitude go away so I could react differently to her. Get it? I am so thankful for second chances, third and fourth chances even, every single day. This smile challenge this week has helped in so many ways. I am keeping track of my progress in my journal. I feel like I am expanding, maturing and becoming a better person when I'm working on the parts of me that need help. I love the fact that I am aware and striving to be the best me possible. Let me know if you're smiling more this week. How has your week improved? E-mail me at les262@embarqmail.com or just PM me here. I'll send you a $5.00 coupon for the SW store!! When I think about all that I have I think of my family first. These three lift me up, support me, love me and believe in me. I love them more than anything!! There are days I wake up and my heart seems to be bursting with complete joy and thankfulness. What a blessing we have in our families!! Last week I decided it was time to take my time back. I had had it with running here and there...so much to do and not really getting anything done. 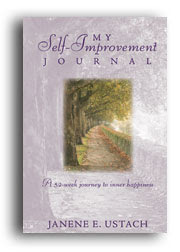 So I took one of my favorite books out "My Self-Improvement Journal" by Janene E. Ustach. I found this little gem when I was visiting Utah 2 summers ago...love it!! Janene takes one word or phrase a week (for 52 weeks) and asks us to focus on just that one word. A few examples...Compliment, Smile and the phrase I worked on last week "slow down". She has one page where she shares a quote, a goal and several ideas for helping you slow down. The next page is totally yours. A place for you to write your feelings, progression or anything you choose. Here are a few of her suggestions for "slowing down". "Drive slower, talk slower, think slower, walk slower, and breathe slower"
"Try not to cram so many errands into a small amount of time." "Get up early to avoid the morning rush"
She used a scripture verse from D&C 10:4 "Do no run faster or labor more that you have strength and means..."
"I really need this this week. I'm feeling frazzled, grumpy, tired, pain in my teeth and neck and just out of sorts. Don't like this feeling." "I have been using this saying all week "slow down" when I feel myself getting overwhelmed. It's been working!!" I was so inspired by the way my attitude turned around I've decided to add this concept to Scrapwords! Every week we will focus on a different word, phrase or quote to help us grow, feel inspired and refresh our spirits. Be sure and check out our word for this week!! Summer is just around the corner and I am soooo excited!! I was reading "The Must Do Summer List" in the June issue of Redbook this morning and it got me to thinking about my own summer list. I think I've created one every year since I was a kid. Lists are so fun anyway. They help you keep track of stuff, they are fun to make and what a great way to save your memories! Keep the list, check off when completed and put in your scrapbook! So, what goes in your Summer List? Anything you want to do...with your family, friends and just you. So grab a pen and paper and let's get listing!! 12. CHA with Meg and Missy in July!! Now it's your turn...make your Summer list!! I haven't been too inspired lately. Not because I don't want to be or not because I'm not trying to be...I've just been too busy. This week, maybe, just maybe I can breathe a bit. I hope so as I can tell I haven't been writing much. Like I've said before writing is like breathing to me...a must. Feeling restless lately. So ready for summer and NO RAIN for awhile. We have nice day then it pours. Very hard to plan things. I am a Republican!! 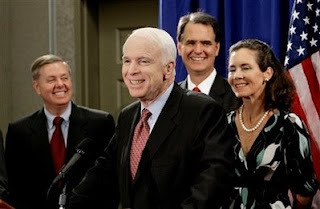 I will be voting for John McMain this November. Now, I haven't always been a conservative. My first election I voted for Walter Mondale. I grew up in a home that hated Ronald Reagan. I was very liberal throughout college and voted strictly Democrat. Even my first year of marriage I held strong to my liberal way of thinking and voted for Bill Clinton the first time. But then, over time, owning a business, seeing a very different side to the Republican party I became CONSERVATIVE! I am proud of that but like I said...there are just a few things you don't talk about-Religion and Politics. I hope my views don't offend anyone. Like I said before...that is the great thing about America. We are FREE to choose. I choose McCain but respect you if you choose Obama or Hillary. Okay, got that out of my system!! LOL!! If you haven't been on Scrapwords in awhile check it out. I posted the 5 Memorable Moments Contest Winners today. They each win an autographed copy of Lisa Bearnson's new book!! This is a photo of my Mom last Thanksgiving. As usual she is working hard to help us have a wonderful dinner. Today I had the opportunity to spend the entire day with her...we had a BLAST!! She surprised me with a Mother's Day gift I'll treasure forever...a bus trip to Kansas City to a Dinner Theater. We began our morning enjoying breakfast with her ladies group at Hy-Vee. What fun it was to sit and listen to the women chatter. I have always enjoyed listening and learning from my elders. At 9:30 we headed to our bus and boarded. By 10:00 AM we were on our way. We visited the whole way down, enjoying our time together. After the fun we headed back to the bus where we got the surprise of our lives...John Davidson, himself popped in!! My mom went right up to him, introduced herself then made sure one of the ladies that wanted to meet him got the chance. He was very gracious and gave her (Phylis) a big hug. Very sweet. I appreciated the time Mom and I got to spend together today. Thanks Mom!! !